The stained glass windows in our sanctuary are from the 1940’s from a synagogue in the lower east side of New York City that was being demolished. The first one represernts Rosh Hashanah: The Hebrew at the top says “Tkiyah” on of the blasts of the shofar. This is consistent with the overlapping shofarot in the window. It was dedicated by the Congregation to Morris and Anne Kaplan for their 55 years of devotion and virtuous service to Agudas Israel. The next one represents Shabbat. The Shabbat window is chockablock with Shabbat symbolism. The Hebrew at the top spells “emet”, truth. In this window one sees challah, havdalah candle, kiddush cup. The word emet is embedded in the image of a Torah scroll. Thus, the word “truth” relates to the Torah itself and not to Shabbat. Dedicated by Mr. and Mrs. Robert Singer in cherished memory of their parents, Sarah and Sigmond Rosenberg and Dorothy and Isaac Singer. The third stained glass looks like a ship. This one is devoted to Jacob’s son, Zebulun (the Hebrew at the top). This image is a reflection of Genesis 49:13. This is the section at the end of Genesis in which Jacob blesses his sons. Of his son Zebulun Jacob says, “Zebulun shall dwell at the seashore, he will be a harbor for ships, with his farthest reach near Sidon. Dedicated by the Congregation In Honor of Ruth and Joseph Gittleman for their generosity and devotion to Agudas Israel. 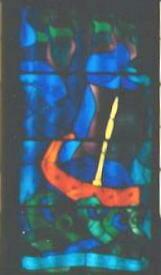 The fourth window is devoted to Jacob’s son Issachar. In Genesis 49:14 says, “Issachar, a boydonkey, lies between the folds. Dedicated in memory of our their parents Hyman and Hannah Kaplan and Seymour and Frances l. Herman. By Bernard and Barbara H. Kaplan.